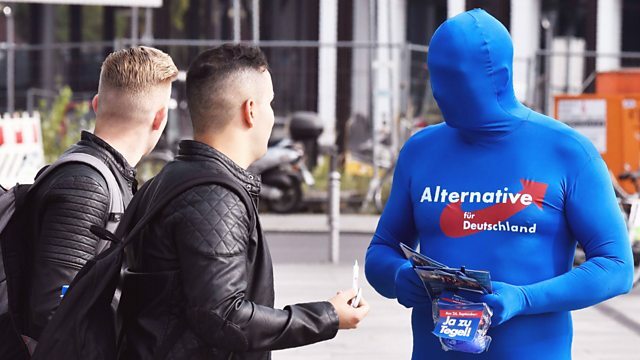 Why did so many Germans vote for the anti-immigration AFD party? Kate Adie introduces correspondents' stories, insights and analysis from around the world. Jenny Hill assess the appeal of the right-wing, nationalist and populist AFD which is now the third biggest party in the German parliament. In Antigua, Jake Wallis Simons watches as the island braces itself for another hurricane while islanders on St Maarten complain they have been abandoned by the rest of the world. In Sudan, Sally Hayden explores some of the unintended consequences that two decades of US economic sanctions are having. In India, Angela Saini wonders whether its Silicon Valley - Bangalore - has finally found it creative spirit. And Jake Warren goes fox hunting in Ireland.